Many books about the American West leave out the more intriguing details . . . For example, when, in 1803, the young USA doubled its size with the purchase from France of an unexplored vastness called La Louisiane, it was a British bank which lent the Americans most of the $15 million that they did not have. So the financial papers for the biggest real-estate deal in history are, to this day, held in a London vault. If his ranching uncle-by-marriage had had his way, the teenaged Winston Churchill–a disappointing scholar–might have been sent west to Wyoming to train as a cowboy. Who knows but, in time, he himself might have become a rancher. How then would history have turned out? Was Butch Cassidy really killed in a Bolivian shoot-out? It seems that he returned, under a false name, to live out his days in the West. In 1935 he even submitted an autobiographical script to Hollywood–only to have it rejected as being ‘too preposterous to be believable’. He died two years later, penniless. ‘Royal tourist visits the Colonies’ was the local headline. In her VC-10, the Queen had flown into the small town of Sheridan in Wyoming. First, she took an extended walkabout along Main Street and then she holidayed for several days on a friend s ranch in the shadow of the Big Horn Mountains… Working for the BBC, Tim Slessor has filmed ‘out West’ for nearly fifty years. 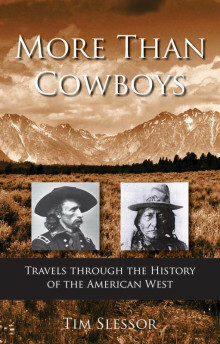 In this book he selects a series of beguiling stories that range from the mountain men and their fur trade to the pioneers of the overland trail, from Custer and the disaster at the Little Big Horn to the last stand of the Sioux at Wounded Knee, from the early cow-towns and the railroads to the cattle barons and the emigrant sod-busters. Full of surprises and insights, More Than Cowboys casts new and entertaining light on the history and personalities of the American West. Tim Slessor is the author of First Overland, the story of the first-entirely-by-land drive from the Channel to Singapore, first published in 1957 and recently republished by Signal Books.